Classic leather Chesterfield sofa. Perfectly worn in. Would be great for photo shoots or the centerpiece of a handsome lounge. Tufted, soft grey velvet. Seats up to four. Great for lounges and photo shoots. Gorgeous deep red velour wingback chairs. Would be great in a lounge or holiday photos. Navy, tufted, velour sofa. Great for photoshoots or lounge. These are truly lounge chairs. That shape and width make you want to kick back and lounge it up. This sofa photographs beautifully. The perfect wine color. Great for a lounge or photoshoot. This Gold velvet chair is so versatile. Great for photoshoots or in a lounge. Mohair velvet chair in a gorgeous raspberry color. Perfect for photo shoots or paired together in a lounge. Perfect shade of forest green. Photoshoot or lounge material. Rattan sofa. Boho vibes. Great for a lounge or photoshoot. Wingback chairs. Sky blue, grey color. Great for a lounge. Tufted wingback chair in a lovely forest green. Pop in a lounge or photoshoot. Blush, cotton velvet, sofa. Seats 4 comfortably. Perfect centerpiece for a lounge. Gold tufted velvet couch is oh so groovy. Great for photoshoots or a lounge. Sweet settee with a soft floral pattern. Would be great for bridal photos or maternity photos. Elegant velvet sofa with tufted seat cushion. Has fringe skirting not pictured. Great for a lounge. This color! All original. Perfect for photoshoots or incorporating in a mini lounge. Love the simplicity of this vintage green velvet sofa. Great color. Seats 2-3. Perfect for photoshoots or lounges. Definitely particular chair for a specific style. Just fun and gorgeous. Sweetheart chairs. Teal, velvet , tufted sofa. Great for that vibrant lounge. Lilac Grey/Mauve color. Great for photoshoots or lounge. Navy, tufted, wingback chairs. Sit so nicely together. Great for a lounge, sweetheart chairs or photoshoot. 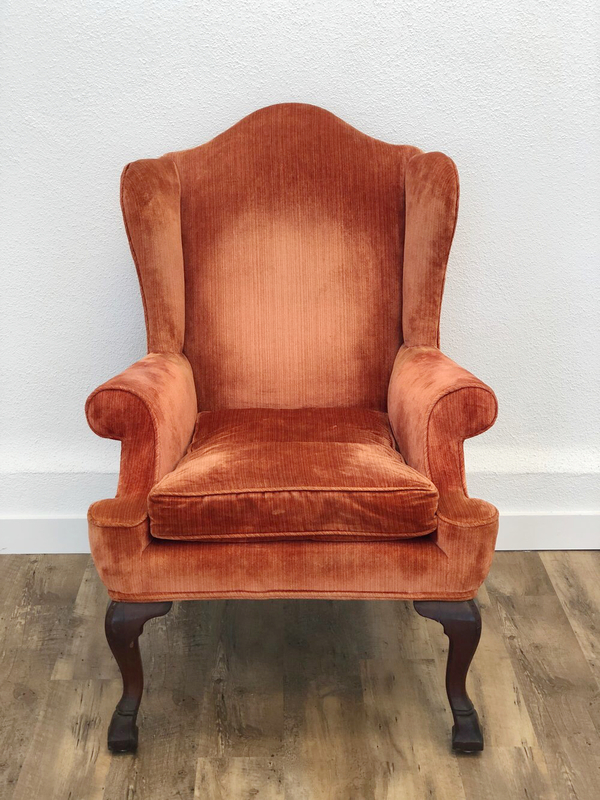 Classic velvet chair with a nice pop of color. Great for photoshoot or in a lounge. She is so fun and funky. Perfect pop of pink. Great for photoshoots. Vibrant blue color. Great for photoshoots or sweetheart settee. Asymmetrical velvet chairs. Mustard Yellow/Gold hint of green color! Perfect in a lounge or as sweetheart chairs. Shellback chairs in an olive green velvet. Need we say more! Lounge, photoshoots. Nice pair of gold velvet chairs. Great for sweetheart chairs. Original salmon velvet fabric. She has some discoloration. splotchiness and a tucked away tear along one side. I can’t reupholster though, she’s too perfectly imperfect, blemished and all. Great for a lounge or photoshoot. A dark emerald green/forest green color. Not to mention velvet & shellback. This color is great year round and for the holidays. Perfect for photo shoots or in a lounge.